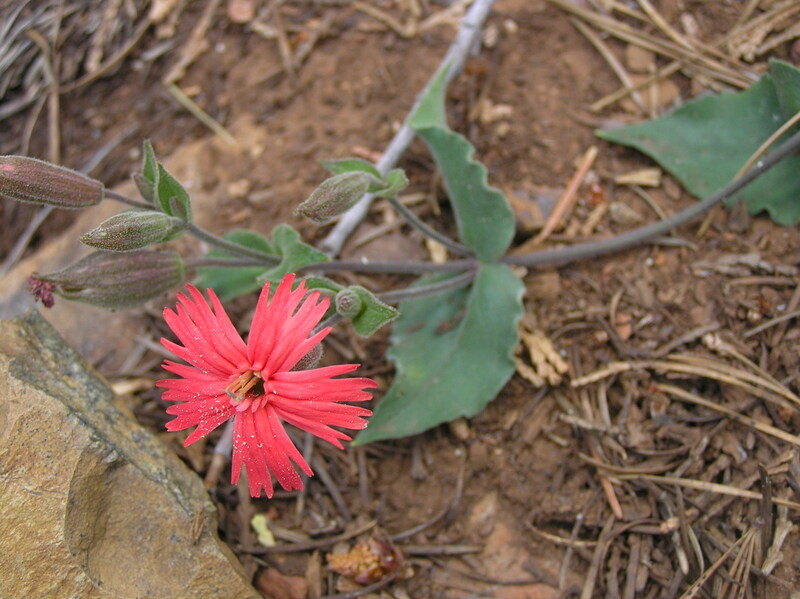 This bright red bloom belongs to Silene laciniata ssp. californica, or California indian pink. The genus Silene has many representatives in our area (Silene lemmonii, Silene occidentalis, and Silene douglasii to name a few). 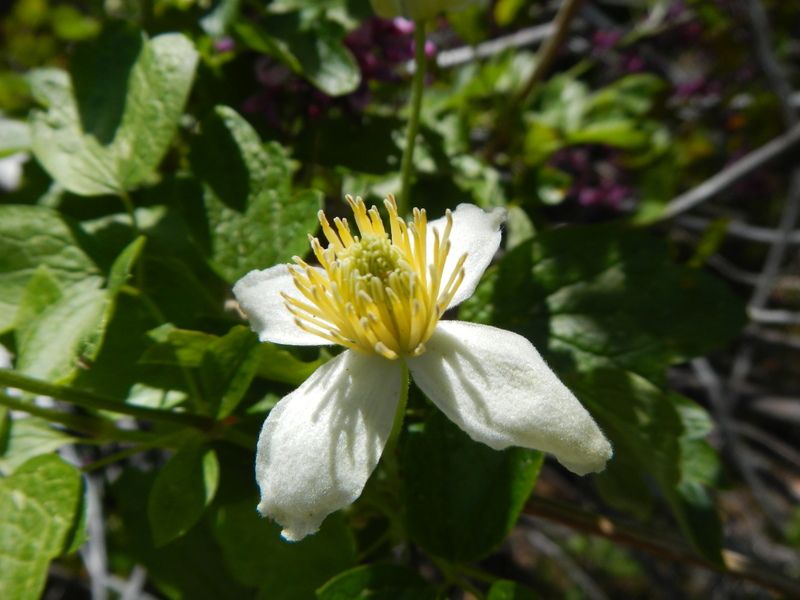 They share with S. laciniata opposite leaves and divided petals, however these other species all have white flowers. Silene laciniata ssp. 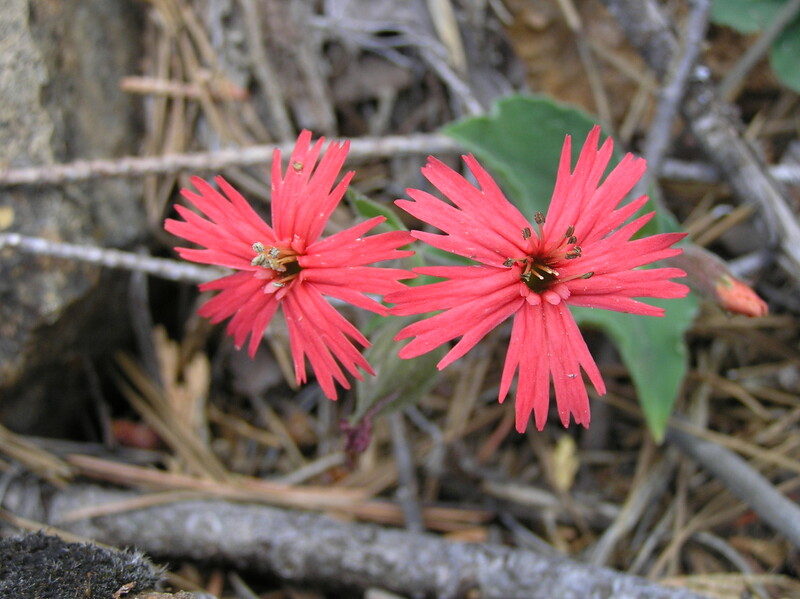 californica is the only northern California catchfly that is red in color. These plants are members of the pink family (a family that includes carnations, dianthus, and many other garden flowers). “Pink” refers not to the color of the flowers, but to the appearance of the petals of many of the species in this family, which look as though someone has taken a pair of pinking shears to them. Although attempts to relocate Brasenia schreberi at Mountain Meadows during a CNPS treasure hunt event last July were thwarted, there are other known populations in our area. One is at Round Valley Reservoir, where this aquatic plant covers a good portion of the lake near the eastern shoreline. And I stumbled across another occurrence last weekend at Last Chance Marsh, the meadows surrounding the northern arm of Lake Almanor. The more I read about this plant the more interesting tidbits I discover! 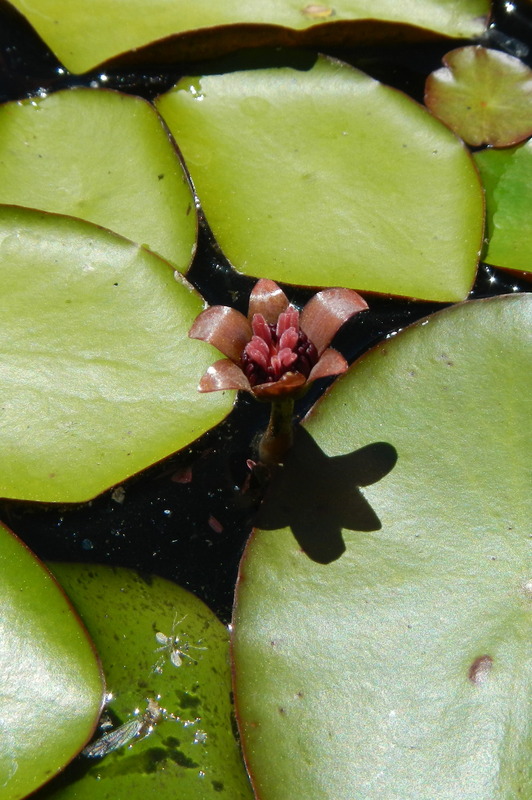 Watershield is a type of water lily, but has been split out into a small family, Cabombaceae that it shares with just one other genus worldwide. Water lilies are among the most primitive plant lineages. Brasenia schreberi has a global distribution, but can be rare within its range. Currently, this species has a California Rare Plant Ranking of 2.3. Watershield are easily identified by their peltate leaves, meaning that the petiole attaches to the underside, not the edge of the leaf. An additional distinguishing character is that the underside of the leaves and the petioles are covered with a thick, mucilaginous coating. Watershield has a nifty strategy, called dichogamy, to discourage self-pollination (per Taylor and Osborn 2006 and Osborn and Schneider 1988). These plants are the only water lilies that are wind pollinated, and they flower over a two-day period. On the first day, the stigmas are exposed (as in the photo at left) to receive pollen from other plants. 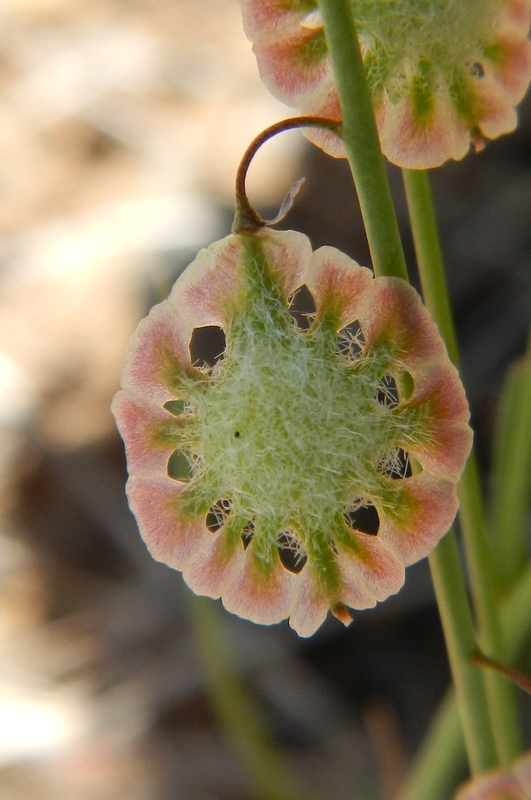 The flower closes, and the the next day reopens with pollen-bearing anthers exposed (see photo below). 2nd day flower with anthers exposed. Peltate leaf with mucilaginous coating. Penstemon is one of my favorite genera, and hot-pink mountain-pride is certainly one of the showiest. Though this species occurs at high (>4,000 ft.) elevations throughout the Cascades, Sierra Nevada, and Klamath ranges, I am much more likely to encounter other Penstemon species such as P. neotericus, P. speciosus, P. gracilentus, P. deustus, P. rydbergii, and P. sudans on the Lassen National Forest. I encountered P. newberryi in bloom last week, growing atop a massive boulder along Rattlesnake Creek, a tributary to Deer Creek. This is typical habitat for the species, which I have also seen growing on granitic rock above Homer Lake and near Bucks Lake. Penstemon flowers display bilateral symmetry, meaning that they are symmetric only across one central axis. Petals are fused into a two-lipped tube that creates a landing pad for pollinators. These include bees, flies, and even (unlike blue- and white-lowered penstemon species) hummingbirds. While I failed to scramble up this rock for close-ups, I snapped some photos (below) of plants that I purchased last year from Floral Native Nursery in Chico and planted into crevices in a rock wall. With minimal irrigation, they are thriving, and a constitute a beautiful, native addition to our yard! This delicate iris with a clunky name also graced the understory around Round Valley. 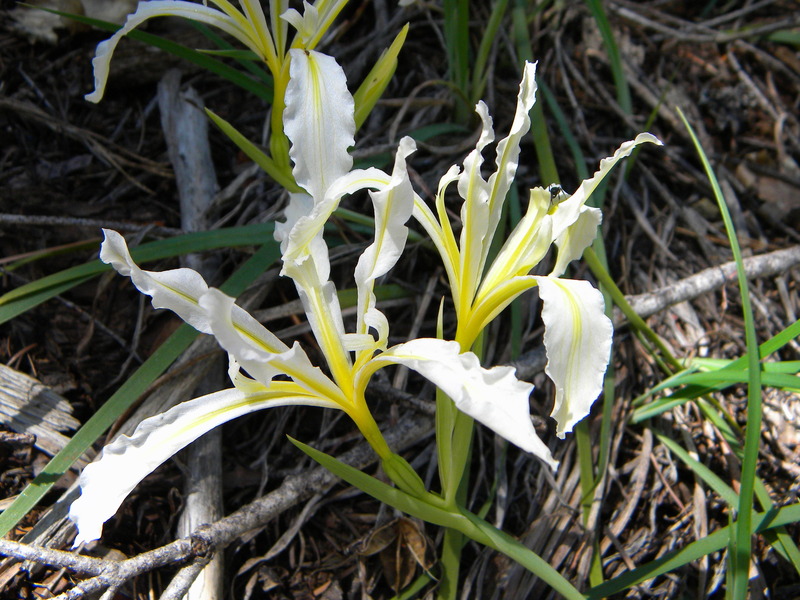 This subspecies of Iris hartwegii is a California endemic, with most recorded occurrences located within Plumas County. Karl Hartweg was a 19th century German botanist who collected throughout the Americas, from Columbia to California. Out near Round Valley Reservoir on a family woodcutting trip, my focus was mainly devoted to issues more urgent than local flora. Namely, Keeping The 3-Year-Old Away from the Chainsaw. And Staving Off Tantrums with Juice and Snacks. But between these urgent duties, I had time to take a peek around the understory of this north-facing, Sierran Mixed Conifer stand to watch June unfold. Rosa gymnocarpa, shown here, was a common understory component, along with Iris hartwegii (Hartweg’s iris), and Arnica discoidea (rayless arnica). 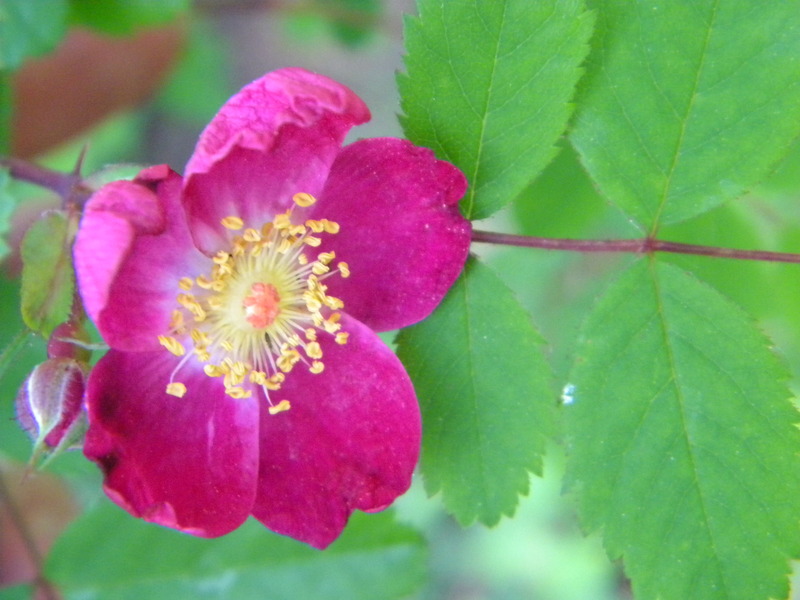 We have several native roses in our area. This one, bald-hip, rose is easiest to spot in the fall when the sepals fall off the rose-hips. 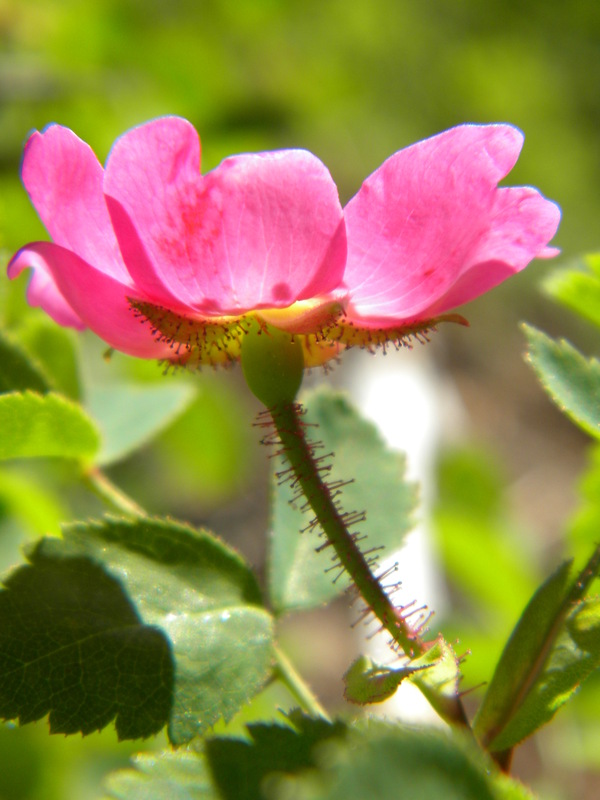 In other local species of rose, the sepals persist, and flare out from the tip of the rose-hip. And another identifiable character of this species, visible here, is that the pedicels (flower stalks) have gland-tipped bristles. 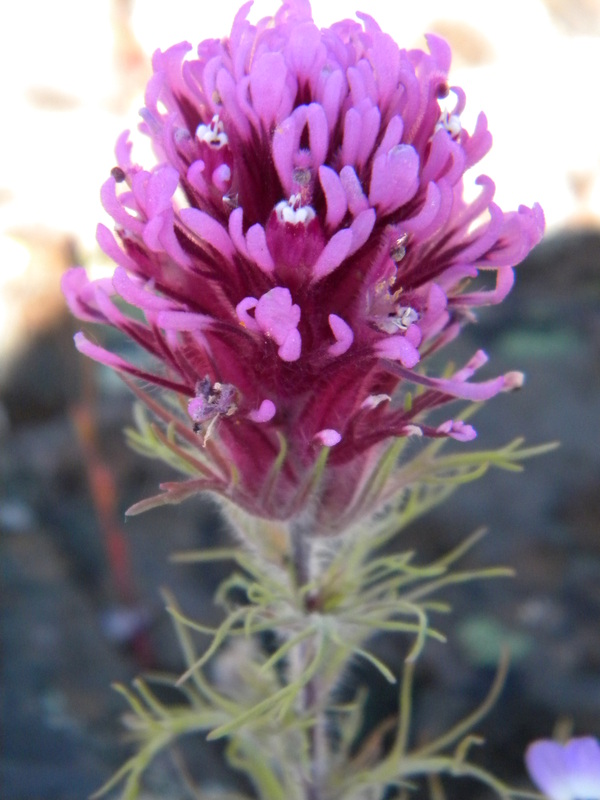 Another show-stopper from North Table Mountain Ecological Reserve, and one of the most exuberant of our paintbrushes. This is purple owl’s clover, a species that is particularly fun to examine under a hand-lens. Up close, each of the flowers does look a bit like a puffed-up owl (CalPhotos hosts a nice close-up image here), though I am uncertain if this is what the common name is intended to describe. Like other members of the Orobanchaceae, this species is a hemiparasite that derives part of its nutrition by parasitizing the roots of other plant species. 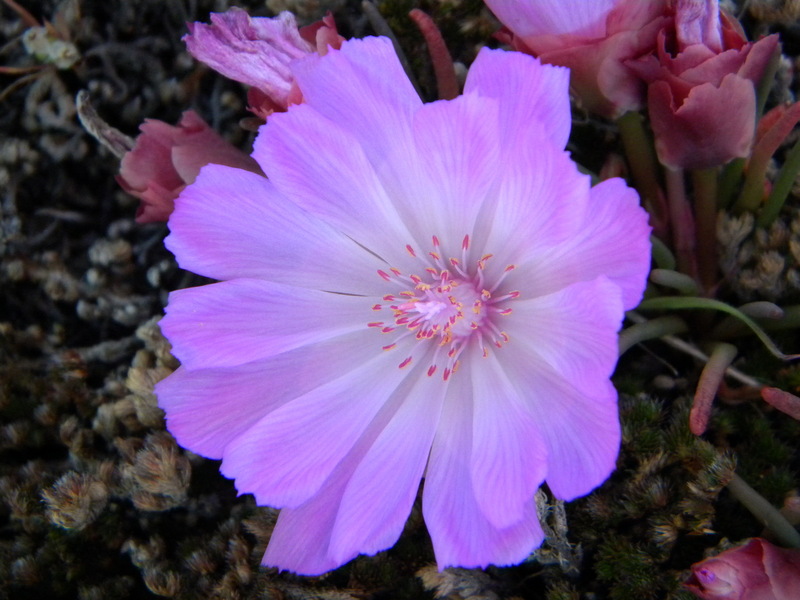 I stepped out of our car at Table Mountain two weeks ago and was immediately greeted with spectacular bitterroot, with its two to three-inch wide blooms. Bitterroot inhabits rocky outcroppings and gravelly substrates across the western states, but it is a species that I have rarely encountered on the Lassen National Forest. I know it better from my years in the Northern Rockies (it is the state flower of Montana). While many of the eye-catching species on Table Mountain are annual species, bitterroot is a perennial. 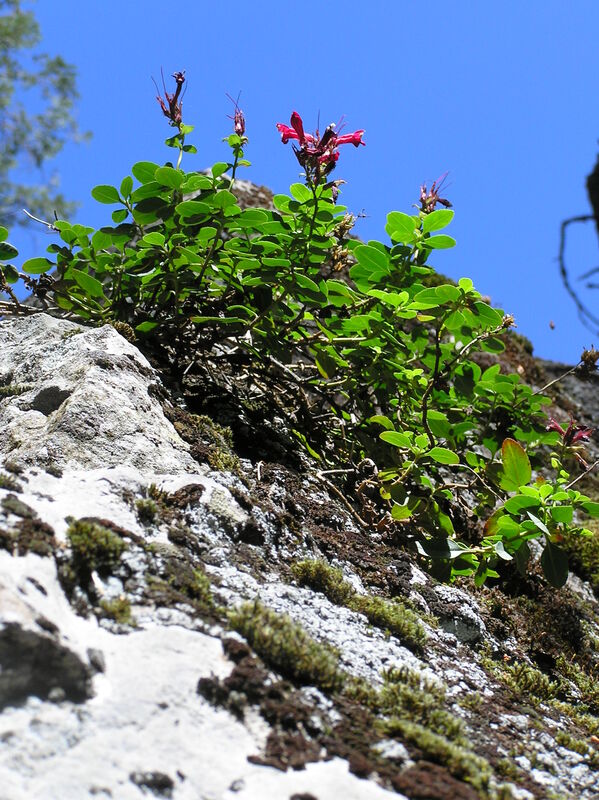 It thrives on inhospitable rock substrates where most plants could not survive, thanks to several adaptations. Bitterroot has a thick taproot that enables the plant to take root in rock crevices. The above-ground portions of the plant will soon vanish without a trace, and the plant will reserve its energy below-ground. 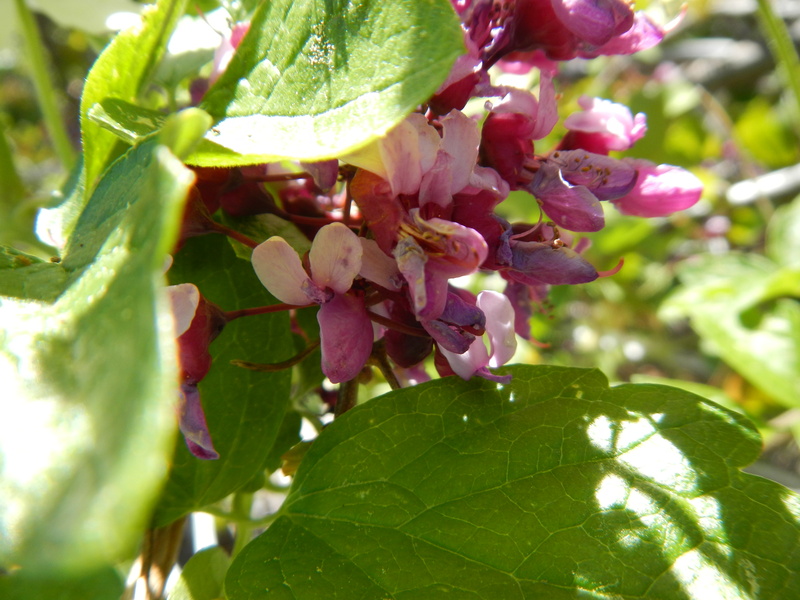 When conditions are favorable in some subsequent spring, the plant will return to life (‘rediviva’ in Latin) and produce its showy blooms once again. In addition, the tissue of rounded and succulent bitterroot leaves store water that the plant can utilize while flowering.